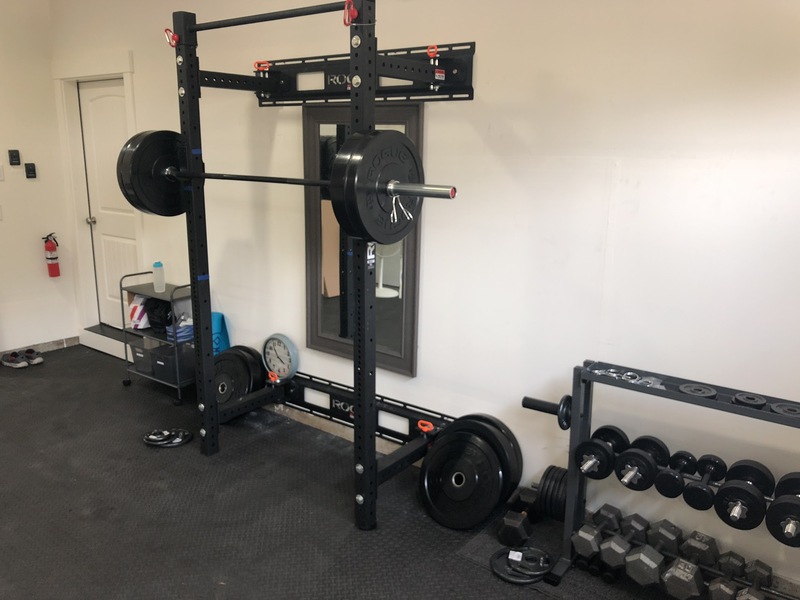 Here's a list of everything I've bought for my gym, total $2,977 plus tax. I actually got some of the dumbbells at garage sales and probably spent about $2700 total including tax. Figuring $50/month each for my wife and me to have gym memberships, this will pay for itself in a little over 2 years. In November of 2016 I started working out with Ryan Linton. I was 30 lbs overweight and starting to feel my age. I knew if I didn't do something soon, I was going to have a body that would hurt for a long time. 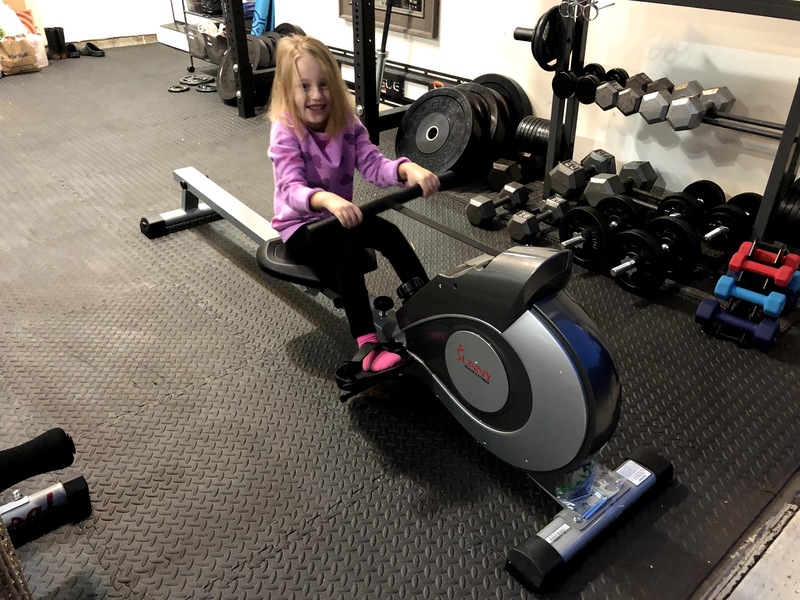 In mid-2018, once my home was restored from the arson that happened 5 months prior, I started thinking about building an in-home gym. 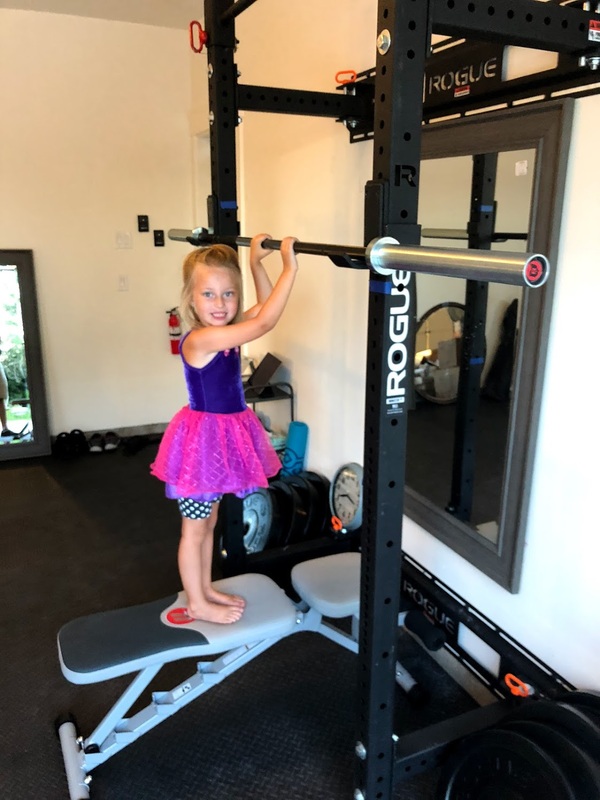 After all, I have a three-car garage and plenty of room, and while I was doing well getting to the gym two to three times per week, I knew I would do better if the gym was in my house. I started by doing a bunch of research and ordered the parts. Here's what I have so far and what I am planning to do next. When it comes to lifting, don't scrimp on the bar or the rack. The RML-3W wall rack has been awesome. I do recommend getting the metal stringers to mount to the wall. It took me and my 13 year old son an hour or so to install and is rock-solid. It's mounted to a wall with 2x6 studs and the lag bolts hold it very securely. The garage floor slopes a bit left-to-right which means I did slide a little 1.25lb weight under one side to level out the rack, but I don't notice the 1/2" difference side-to-side. There's also a super simple adjustment in the way it's engineered that lets it sit on the floor no matter what. When folded against the wall, it takes up very little room. I don't however fold it up very often -- there really isn't any point, since there's plenty of room to do everything we need to do, and we don't park in that garage bay. It takes about 2 minutes to fold up or unfold. The J-hooks are solid and it feels pro. I'm 6'-4" and the pull-up bar is high enough (especially considering I don't have much more ceiling height to work with). The Alpha set includes the Rogue Ohio Bar (20kg/44lbs) in Black Zinc/Bright Zinc. I absolutely love this bar. It's somewhat flexible so it feels "alive" and yet has the strength to easily load on 400 lbs, which is the most I've put on it. It's also 28.5mm in diameter (1 1/8”) which is somewhat smaller and feels very good in the hand. It works great for deadlift, squats (front and back), bench, overhead press, and everything else I've tried it with. 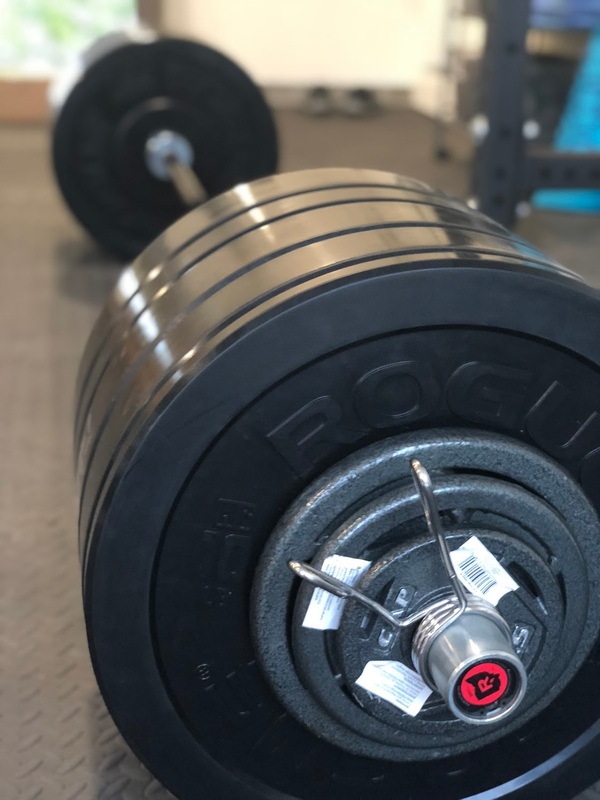 The bumper set is great because it includes four 45 lb bumper plates, two 35s, two 25s, and two 10s. Bumper plates are fantastic, if you haven't tried them yet. I will only buy bumper plates for the majority of my bar weight. It also comes with V3 Monster Lite J-Cups (j-hooks) and a pair of Rogue Spring Collars. I also bought an extra set of 10s, 5s, and 2.5s from Amazon to round out the set. I recommend this set of CAP Barbell plates from Amazon. This bench isn't fancy but it is sturdy and does the job and the price is right. The only thing I don't like about it is that doing face-down incline movements is tough. 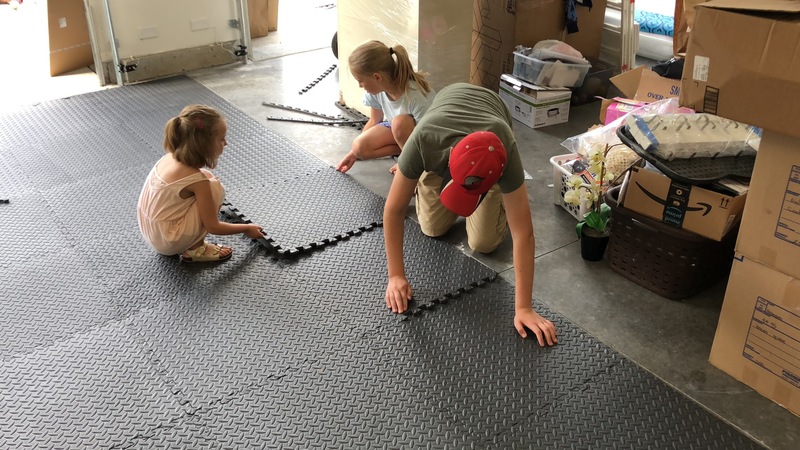 This set of interlocking rubber mats was perfectly sized for my gym. It was so easy to put together that my kids did it. They feel good on my feet and withstand the bumper plates being dropped without a problem. I haven't gotten around to mounting these yet (I'm waiting until I get time to also get the mirrors listed at the end of this), but they seem sturdy enough. They're from Titan, which is a lower-cost alternative to Rogue. 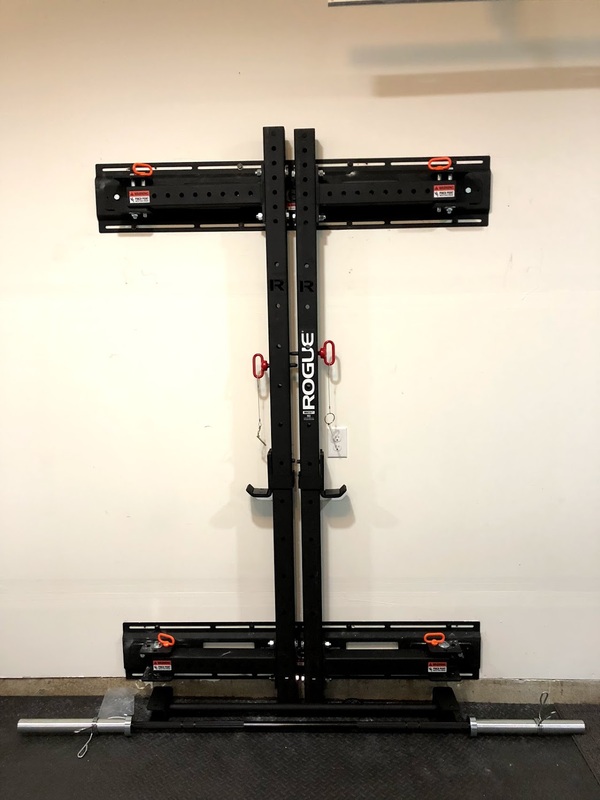 For wall storage, I figure the cheaper option is fine (I wouldn't buy a Titan wall rack though). 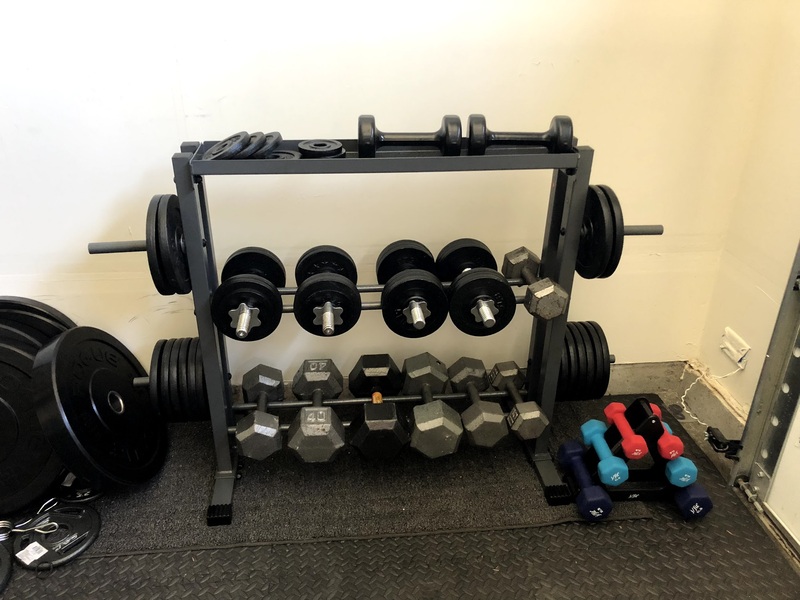 To store all the dumbbells and a few of the barbells, we bought this weight storage rack. It does the job and is strong enough. These CAP hex dumbbells are convenient and rugged. I bought 12, 15, 20, 25, and 40 lb pairs, mostly from garage sales, but you can see them on Amazon at the link. I would recommend getting 10, 12, 15, 20, 25, 30, 35, 40, 45, and 50 lbs if you have the budget. They're my go-to dumbbells. For the in-between weights, I use the adjustable weights (next 2 items). These dumbbells aren't my favorite. I actually have two sets, since I bought one set from my brother. They sit mostly unused on the weight rack now that I have the other dumbbells (see below). I would only recommend buying them if you're on a tight budget but need a really wide and flexible range of weight. They're a pain to adjust and frequently come loose. They also tend to clink together when doing overhead press, because the bars are super long. But I have also put a lot of heavy reps up with them, so they will do the job. These awkward-looking things are actually very pleasant to use. Unlike the other adjustable dumbbells, they're very quick to change to a different weight. You can adjust in 2.5 lb adjustments and go from 5 lbs to 50 lbs. (It for some reason doesn't include a setting for 12.5 lbs, though.) They're not hard on your hands and feel comfortable. These small dumbbells are used more by my wife, but come in handy for things like Lu Raises. These bands are okay, but feel light to me. They're fine for face pulls. I wish they had a little more resistence. This rowing machine is decent. If you have a bigger budget you might consider a higher quality one. Otherwise, this works fine. I've made a few Strong Fitness routines that I really love. Click each link to download the routine to your phone. Note that some of the product links are affiliate links. I don't endorse them for the affiliate money, which more or less just helps pay for hosting my website, but rather because I use these products every week in my gym and like them.